It’s easy to think that buying organic food helps to support local communities and protect the environment from the heavy hand of big agriculture. But the reality is not so clear cut. A detailed new analysis finds that organic farming is not always more upstanding than its conventional counterpart. One of trickiest challenges facing society is how to produce enough food for growing populations without wrecking the environment and local communities. A study published on March 10 in the journal Science Advances finds that organic agriculture is not the “holy grail” of sustainable agriculture that its image suggests. “It’s not enough just to do organic,” said Verena Seufert, a researcher at the University of British Columbia, Canada, and a lead author of the study. “There is not a single answer to whether organic performs better or worse than conventional agriculture,” she added. The study finds that organic farming is better than conventional agriculture in some important ways. “The clearest benefit of organic agriculture is that farm workers are exposed to fewer potentially toxic pesticides,” said Seufert. Also, lower levels of pesticide residues are found on organic produce. This is of most benefit for people living in low-income countries which tend to have weak controls on pesticide use. But it will make little difference to the health of consumers in the U.S. or Europe, for example, where pesticide residues on conventionally grown food are very low, the study says. It also confirms previous findings that organic food is more nutritious, but the slightly higher levels of vitamins and other wholesome compounds are unlikely large enough to boost consumers health, said Seufert. Organic agriculture is also a boon for financially fraught farmers. “Farmers often struggle to make ends meet and must supplement their income through other activities,” said Seufert. Organic produce commands a higher price making it more profitable, the study finds. 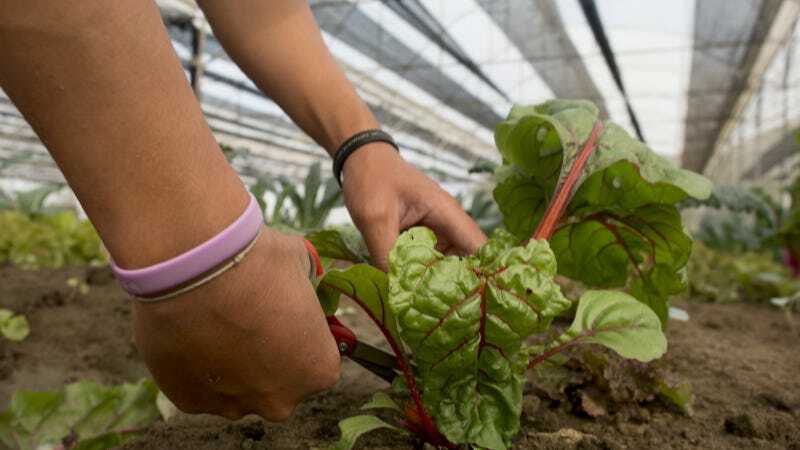 However, organic farmers do not seem to provide better working conditions or wages to laborers, according to the limited available evidence, said Seufert. While organic farms are friendlier to wildlife such as bees they are not always kinder to the environment overall, the study says. This is because organic farms produce less food on the same area of land compared to conventional farms. Lower organic yields mean that more land is put to work. And for the same amount of food produced, organic farms also tend to release more nitrogen pollution than conventional farms. The new analysis is one of the most comprehensive to date comparing large-scale organic and conventional farming. It clarifies previous mixed conclusions on organic farming’s green credentials. Other research has shown that smaller community gardens are important sources of organic produce, and have a plethora of socioeconomic and environmental benefits such as saving on shipping costs and packaging and providing green spaces for people to enjoy. “This does not imply that organic agriculture is bad or should not be part of the solution. It just means we need to improve organic agriculture and make it better,” said Seufert. Amending organic regulations to better promote environmentally friendly farming practices such as rotating crops could help make organic farming more sustainable, said Seufert. Currently, organic regulations mainly focus on restricting chemical inputs such as pesticides and fertilizers. “If you want to make organic sustainable you must include environmental best practices in regulations,” she said. In addition, researchers need to develop new crops varieties that are bred to perform well in organic systems, such as crops that can grow well with less fertilizer. Today, most of the crops grown on organic farms were bred for conventional agriculture where nutrient rich chemical fertilizer is liberally applied. John Reganold, an agro-ecologist at Washington State University, said that the new study agrees with much of his own findings on organic farming including that it better supports ecosystem services such as bio-pest control and healthier soils. But he said the future of farming will likely sit in the “middle ground” between organic and conventional agriculture where farmers will use green farming methods alongside chemicals inputs. Such hybrid farming will be more sustainable by “better balancing” profit and productivity with social and environmental concerns, he said. Organic farming is helping to drive a move towards sustainable agriculture by encouraging conventional farmers to adopt environmentally friendly practices, said Reganold. “Organic farming is pulling conventional farmers towards the middle ground. This will have a tremendous impact,” he said. And although organic produce is grown on only 1% of global farmland, it can have a strong influence on agricultural markets. It is the fastest growing food sector in North America and Europe. Consumers recognize and demand the organic food label, said Seufert. “Therefore, at the moment, organic is the most important way that consumers can influence how their food is produced,” she said.